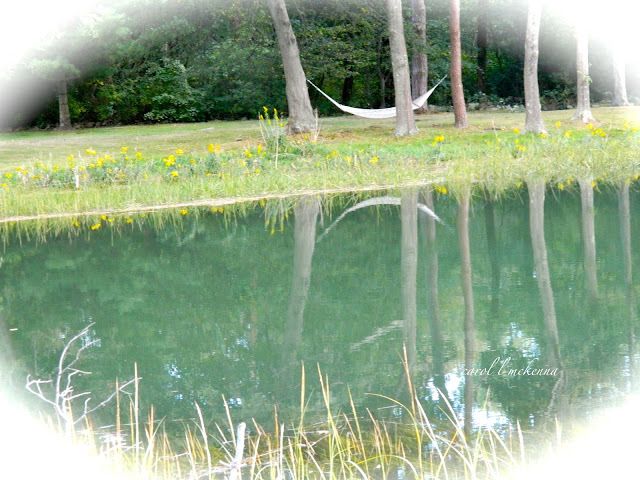 Sunday Post ~ Sketchers and Photographers ~ Happy with the first photo as it truly depicts 'peace and serenity to me. The bottom photo is a sketch ~ just that a 'sketch' as I will do this over but wanted something to post for Sunday Sketchers. It has just been 'one of those weeks'. Good things but some self induced stress thrown in for 'good measure.' Tired and thinking in 'cliches.' Thus, my creativity suffered. Wishing you a wonderful Sunday and a peaceful and serene week. Looks like a pretty place to pass a peaceful Sunday afternoon. I love the photo. It does speak peace. Wish I was there. Sorry you're tired. I know how draining that can be. I have spotted your chop, and your name in Chinese. And I also spotted a hammock, so peacefully. Oh that first one is such an idyllic scene! Fall is here but that image evokes long lazy days of summer. Lovely reflection! The photograph is beautiful and I can just imagine the peace sleeping in that hammock. Your sketch is great considering you think you are in a creative temporary slump...happens to us all. Peace of mind ... lovely !!! That first shot certainly says peace to me. Thanks for joining Nancy's Your Sunday Best. Wishing you peace and serenity! I totally understand that sometimes circumstances take us away from our creative mindset! Beautiful photos to remind us! nice tribute to Peace, such a wonderful word! Your photo is so peachful and relaxing! Oh to be in that hammock! Very beautiful and peaceful image! I love my hammock too! I love my hammock too! Great shot! Beautiful reflection, lovely happy flowers! oh that hammock has my name all over it! Hammocks are always synonymous with peacefulness for me. I don't think you can stay stressed when lazing in a hammock. Your sketch goes perfectly with your photo! That hammock is pure heaven!! i love the way your hammock floats on the water like a gorgeous sliver of moon! may this week be that peaceful and adorned with light. thinking of you. It was your haiga that I was immediately drawn to! I love it! The calligraphy is so flowing! Thank you for the peaceful thoughts. The photo is wonderful and would love to be there! That photo is so inviting. I want to go straight to the hammock and hang out there all day! The brushwork you did is lovely and I enjoyed your haiku. great colors!